The All-Star program provides leadership and service opportunities to young people who have spent their formative years in foster care. For young adults who have beaten the odds and thrived in spite of difficult circumstances, the All-Star internship is an opportunity to communicate your unique perspectives and resilient spirits with your peers. In addition to participating in a large number of nationwide events for youth and child welfare professionals over the summer, the FosterClub All-Stars will provide trainings, advocate for system improvement and promote public awareness nationally throughout the year and teach other youth, adults and child welfare professionals in their states, youth boards and homes how to advocate for themselves and the youth in care. 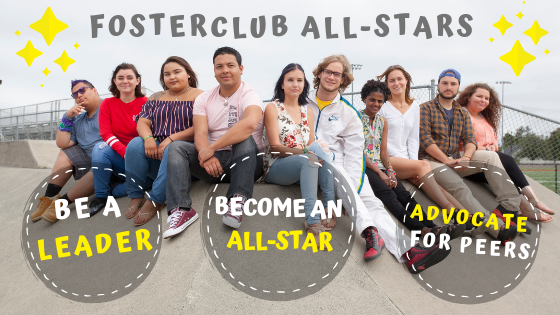 As an important part of their training, FosterClub works with the All-Stars to understand their personal experiences and empower themselves and peers to connect with other youth to build a community of support, identity and understanding. Participants learn to reframe their foster care experiences as relevant expertise and to use that expertise effectively to motivate their peers, child welfare staff and the public to action on behalf of children and youth in care. The internship begins with a 7-week training at FosterClub headquarters in Seaside, Oregon but opportunities for advocacy are provided year-round. Weekly living allowance - All-Stars will receive $150 per week for the duration of the training. Bonus end of session stipend - All-Stars will receive an honorarium of $1500 once they successfully complete the full 7-week training. Free housing during internship (more information below). Cell phone stipends - If the All-Star has a working cell phone, FosterClub will issue two $60 stipends. Travel to and from the internship - All transportation and travel costs to and from Seaside, Oregon will be covered by FosterClub. Travel to and from nationwide events - All transportation and travel costs to off-site events, conferences, and trainings during the summer will be covered by FosterClub. Cultural & recreational experiences - FosterClub tries to provide a variety of recreational, cultural, and fun experiences outside of working hours throughout the summer. This can include physical activities (e.g. hiking, kayaking, swimming), indoor activities (e.g. dance night, art & crafts), and other opportunities (e.g. watching a play, fishing, yoga). Activities differ each year. Leadership training - FosterClub staff conduct intensive training of the All-Stars for the first few weeks of the internship. All-Stars will begin to develop public speaking skills, leadership skills, facilitation skills, strategic sharing, and much more. As the All-Stars become experts on the FosterClub curriculum, they will be asked to facilitate workshops, sit on panels, and educate peers and professionals at events around the country. In order to apply, youth must meet the following requirements. If you are unsure if you qualify, please email us at youngleaders@fosterclub.com or call at 503-717-1552. Have firsthand experience in the child welfare system - This includes (but is not limited to): foster care, adoption, and relative/kinship care. Be between the ages of 18 and 24 - All-Stars must be 18-24 on internship start date. Be responsible and require minimal supervision - All-Stars will primarily be unsupervised outside of working hours. Be able and willing to travel - All-Stars will need valid identification and authorization to travel by car and plane. Be able and willing to be photographed. Be able to obtain required permissions from foster care agency if still in foster care. Be willing to undergo a background check - All offers of employment are made upon the successful completion of a background check. All-Stars may not begin until background checks are completed. Violations do not necessarily disqualify an applicant. The 2019 All-Star application process will begin on January 1st. Two recommendations - 2 recommendations must be submitted online by adults who can speak of your skills, character, work ethic, experience, etc. Interviews will begin in March 2019. Selections will be made and announced in April 2019. Priority will be given to young people who have previously attended a FosterClub Teen Conference, participated on a Youth Advisory Board, or who have demonstrated leadership skills or leadership potential in their communities. Commitment to diversity: We make selections to help us achieve diversity in culture, race, sexual orientation, gender identity, educational background, foster care experience, etc. Part of our mission is to work to make sure foster youth are accurately represented across the nation and this includes showcasing as many diverse perspectives and experiences as we can. Young people who apply but are not selected should in no way view that as an indication of their abilities or personality. It simply means that other youth were selected to help us build a diverse team for the program. Prepare and facilitate workshops and activities at conferences and other events. Provide guidance, advice, and knowledge to peers in the system. Produce products, including publications, web content, audio/video recordings, and photo shoots. Research topics pertaining to child welfare. Provide youth perspective content for supportive adults. Write blogs about your experiences as an All-Star. The All-Star internship is built to provide our young leaders with professional development opportunities and coaching. All-Stars can expect to develop the following skills and experience. In 2014, FosterClub partnered with Impact Justice to conduct a three year evaluation of our All-Star internship program. The goal was to determine how the program affected participants and added value beyond other leadership programs available to foster youth; the following framework was developed as a result. These five areas are where FosterClub will focus our efforts of growth in the All-Star interns. Story of Self (Personal Narrative): Understand how to tell your story to: protect yourself and others, connect with others and influence change, and attribute positive purpose to past experiences. Meaningful Purpose: See self as able to serve others rather than solely as a recipient of services. Attachment & Connectedness: Understand how to establish healthy boundaries in relationships, keep from being taken advantage of, and be willing to put trust in others when appropriate. Self Regulation: Understand how past trauma might impact behaviors, and understand how to maintain relationships after conflict. Build skills to self regulate in healthy ways, and to manage stress and well-being. Knowledge of the System: Understand how the system works and what resources are available to you as someone who has experienced foster care. All-Star interns are generally free to do what they'd like outside of working hours, however FosterClub has a few non-negotiable rules for the duration of the 7-week training. No Illegal Drugs or Alcohol: Minors are prohibited from using alcohol, cigarettes, or marijuana in Oregon until the age of 21. An All-Star aged 21 or over must not use or possess alcohol or marijuana within the house, in the presence of minor All-Stars, or while on duty with FosterClub (this includes overnight travel). No Fraternization: No sexual or romantic relations with All-Stars, L2’s, Staff or FosterClub clients. Working as a unit, the All-Stars will need to act and carry on a professional relationship with one another. No Criminal Activity: All-Stars participating, accessory to, or acting out in criminal activity will be asked to leave the program. Expectancy of Performance: The All-Star Program may demand travel, overnight stays, early mornings and late night – and prompt attendance is required. Full participation in training sessions and all activities is expected. All-Stars will be provided free housing in Seaside, Oregon; the “home base” for the summer internship. The All-Stars, when not traveling will live in the All-Star House located in downtown Seaside, just blocks from the Pacific Ocean. Learn more about Seaside, Oregon. All-Stars must be comfortable with the following housing conditions. Interns will live in shared rooms in a furnished duplex approximately 0.5 miles from FosterClub HQ. Interns are responsible for their own transportation to and from HQ each day. Interns must be comfortable living without staff supervision, although FosterClub staff are local and available for urgent needs. Interns will be required to sign a lease with FosterClub upon arrival. FosterClub staff will conduct weekly housing checks to ensure the household is in working order and to perform maintenance. Housing is not divided by gender, so we can not guarantee that you will be sharing a room with a particular gender (although we will try to accommodate to the best of our ability if requested). Alcohol, smoking, and any illegal activity is strictly prohibited from the All-Star House. Any violation of these expectations is grounds for dismissal from the program. If you have any questions, please reach out to youngleaders@fosterclub.com or 503.717.1552. If you are still in care and your caseworker, foster parent or guardian have any questions, we also encourage them to call.